CAD82: 5th International Conference and Exhibition on Computers in Design Engineering is a collection of conference and review papers related to design engineering. 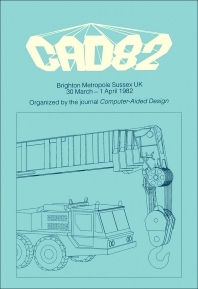 The book, which is divided into 18 parts, covers papers on talking points in Computer-Aided Design (CAD), including micros in the design office, drafting systems, and introducing CAD into the industry. The text presents papers on building design, CAD/CAM, databases, education, electronics, geometric modeling, graphics, mechanical engineering, and structures. The book concludes by providing poster sessions that tackle topics, such as a formalized methodology in CAD, which provides a framework for exploring such design and performance relationships for multi-variable, multi-objective problems; a system for computer-aided architectural design; a technique for automatic interpretation; and a system of modeling three-dimensional roof forms. Design engineers and students taking CAD courses will find this book helpful.